Contact us for high-performance Radix RO Antiscalants now food grade certified by NSF, USA! The company is the well-known Manufacturer, Importer & Supplier of eco-friendly RO Antiscalants based in New Delhi, India. Purity, accurate pH value and quick results are the highlights of our RO Antiscalants. Our premium quality RO Antiscalants are processed using high quality chemical compounds under the strict supervision of experts. Antiscalants are widely used for removing bacteria and excess salt from water so as to make it clean and fit for consumption. 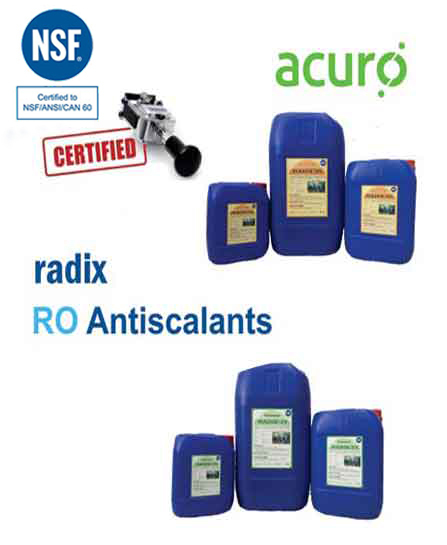 Available Packing : RADIX antiscalants are available in 5 kg and 25 kg HDPE containers.